The “Made in America” claim is used to describe the extent of a product’s US origin. Although the reasons may vary, the steps for obtaining an “American Made” certification are very simple and straightforward. You must first fill out an online form with the Made in America brand, self-certify that you meet the requirements of displaying a “Made in America” certification, and get accredited by the brand. 1. You must be able to prove that your company has been in operation for 12+ months. 3. You must retain evidence that your product will continue to be made/produced/assembled in America (that is, you must prove you will continue to be eligible for the certification). 4. You must provide exceptional services and produce well-made goods. 5. You must pay an annual licensing fee based on your company’s annual revenue. There are four separate “Made in America” certifications which describe the number of American materials that the product was made with. The minimum is a “51% American Made” credential, the next highest being 75%, then 90%, and then 100% American-made. The percentage is determined by several factors, including where the final manufacturing step/assembly/processing took place and what materials make up the components of the final product. The FTC requires that, specifically for apparel, the final product must be manufactured in the United States, of fabric that was manufactured in America (regardless of where the raw materials to make the fabric came from). Even if a garment is made of raw components that originated in America, it is not considered “American made” if it was manufactured outside of the US because the raw materials are considered too far removed from the final product to have bearing on where it originated. 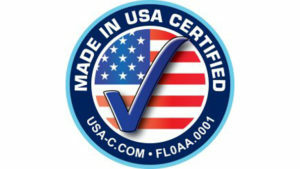 If your product does not qualify for a “Made in America” seal (ie, your product is made of 50% or less American materials or was not fully manufactured in America), you can apply for a qualified claim certification. There are declarative certifications (for example, “Made with American materials and assembled in another country” or “Made from American steel”) and comparative ones (“Made with 20% more American materials than our leading competitor”). This is a clever technique that can help a brand showcase its desire to be “Made in America” without having all the requirements met. The awareness for “Made in America” is growing. This initiative has many domestic backers, and more and more money is being spent promoting this idea. Now is the time to consider domestic apparel manufacturing. Let Indie Source show you why “American Made” has great branding capabilities. Fashion Shows: A Necessity or a Desire?